Free for a limited time! Receive a 2 pack of Cyclo ProGuard Orbital Backing Plates AND a Cyclo apron when you purchase this Cyclo Orbital Polisher kit. A $59.98 value! The Cyclo Orbital Polisher has been polishing planes, automobiles, and RVs since 1953, when they received patents on their orbital polishing mechanisms. That same year, the company received approval from the US government to polish the militaryï¿½s aircraft and missiles. The Cyclo Polisher is still used today to polish the Air Force One fleet. The Cyclo Intro Kit is the perfect starter kit for new Cyclo users. It includes the polisher and two Cyclo Deluxe 4 inch Blue Polishing Pads. With the Cyclo Intro Kit you can apply ultra fine polishes, waxes, and sealants. As you become comfortable with the Cyclo, explore Cycloï¿½s other foam and wool pads, all of which work with the included backing plates. The Cyclo Polisher is the only dual-head polisher on the market. Both heads move in an orbital motion, counter-clockwise. The idea is to simulate hand polishing but at a much faster rate. Going over a scratch or swirl with both heads ensures that you are attacking it from all sides, so to speak. No matter what angle you look at the paint, you will not see the former blemish. Itï¿½s the fool-proof polisher! The Vibration Elimination System (VESï¿½) is available exclusively on Cyclo Dual Head Orbital Polishers. This system is composed of a completely redesigned counterweight and precision matched, weighted inserts, which nearly eliminate the amount of vibration felt by the operator. This drastic reduction in vibration lessens muscle and joint fatigue for the operator. The counterweights are pre-installed on the Cyclo. The Cyclo Intro Kit is where smooth, shiny paint begins. See all of Cycloï¿½s 4 inch Premium Pads and bonnets to find solutions to all your detailing needs. A total retail value of $422.95. Save $62.96! The Cyclo 5-Pro has a variable speed controller with speeds from 650-3000 OPM and includes two ProGuard Backing Plates! I want to tell you how much I've enjoyed using my Cyclo Orbital Polisher. I purchased it after seeing Mike Phillips' demonstration on the Speed Channel show "Two Guys Garage." My 2002 Thunderbird had begun to show swirl marks in the clear coat. The Cyclo proved a fast, efficient way of removing them without damaging the finish. Only those of us who have struggled with this annoying and time-consuming problem can appreciate what a delight the Cyclo Polisher is. I didn't want to wait before telling you how pleased and impressed I am. I was afraid to use a rotary polisher on my car, but the Cyclo is a safe alternative that delivers high quality results. I find it to be the ultimate orbital polisher. This is a great Machine. I have the quick connect kit. Work great. Wet sand, orange pad with Menzerna Power Gloss, blue pad with Menzerna Super Finish, and bam! You have yourself some great looking paint. Nothing beats a good rotory though. Menzerna Super Finish with a blue 3M pad will make your paint gloss out like crazy if you know how to use a rotory. I purchased this for my employees and for quick one step scratch removal. 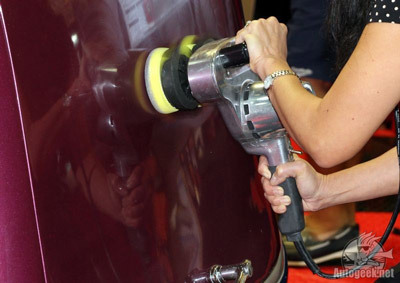 Orange pad with the Menzerna Power Gloss will remove light scratches while leaving the paint glossy and swirl free.